You'll find 25 ads daily for a price per click of 0.001 $ when you're standard user. The latest status attributed to this site by nbr is : promising. By looking at our grade, you can see at a glance if this Paid To Click is a scam or legit PTC.The minimum to cashout is 0.20 $ and the TOS said that the payment deadline is no idea. You can choose among the following payout methods : Paypal, Payza, PerfectMoney. With this P.T.C. website you will win 70 % of your referral earnings.The total number of members reached was 1000 at the last update. We suggest you to use this link to be referred on Refbankers. Inpite of PTC sites, there are several survey sites that pays much more than PTC sites. After completing surveys, you could redeem for cash, vouchers, sweepstakes, and so on. Here is the link provided for one of the best survey sites, which is paying from 2008. It is very easy to register and earn. 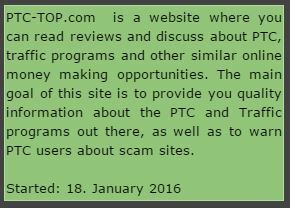 We all know that PTC industry is dying and most of the members are switching to Cryptocurrency related sites. 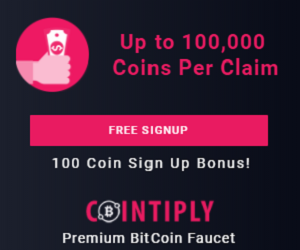 If we don't start adding those sites then Refbankers might die as well but we never want that to happen So we will start adding paying Cryptocurrency related sites or faucets. The biggest disadvantage is that, on those sites we cannot see our referral earnings and because of that we cannot offer refback for those sites. Instead, we will offer free cash and banner credits to members who join them as our referral. This way Refbankers will keep going strong. At least it will help members who are looking for good sites to earn. We have enabled PerfectMoney for withdrawals. But due to limited funds you can cashout only up to $2.50... Any payment request over $2.50 will be cancelled.